Have you heard of how toner may harm our skin instead of help our skin? But you do not want to skip toner and this trigger you into looking for something that is really harmless and useful? Checkout Skylake Oriental Herb Relax Toner. I have tried them and it helps to balance my skin oiliness and keep my skin in a manageable state. My skin feels refreshing after used. Can be spray on face without closing the eyes. Gentle formula that is edible. Improve skin texture, clarity and complexion. Reduces redness, sensitivity and calm rashes. Check out Hebeloft Website for more information. How to use Skylake Oriental Herb Relax Toner? Use on cleanse face. Spray onto face and neck. Let it dry before applying other products. It can also be use as a spray mist, aftershave as well as soothing body spray for baby. Are you looking for harmless toner that will benefit your skin? 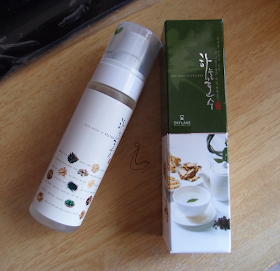 I have a chance to try out Skylake Oriental Herb Relax Toner. Came in a nice spray bottle. This toner came in a nice spray bottle. 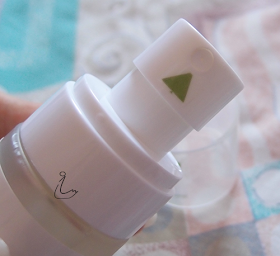 Arrow sticker to let you find the spray nozzle easily. The toner has a transparent watery texture. Although it contain mostly herbal and plant ingredients, I can't really smell anything from it. Also, I only found out that this toner is edible!!! Well, I don't dare to try it. But am really glad that it is really a harmless and gentle toner. My skin feels really refreshing after spraying and it is absorbed well by my skin. It prepares my skin well for other skincare application. I like it that it can be apply to eye area as well. 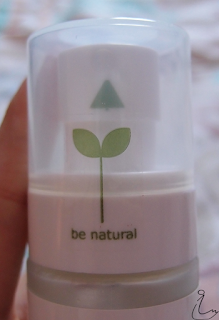 Although it is better to spray directly, but when I first use this toner, I still like it used with cotton pad. Reason is that I tend to spray out of my face, wasting the toner. But after using for sometime, my aiming is more accurate, I have been spraying it. Feels more refreshing spraying than using cotton pad. During the first few weeks, I really cannot tell what is the different using this toner. Soon, I started to realise that my oil control is much more balance. This have in turn helps lessen the appearance of blemish, making my skin more manageable. I have slowly grow to like this toner. Will highly consider to use it as my permanent toner. Skylake Oriental Herb Relax Toner can be bought online as well as from Hebeloft counter and BHG and Metro. Check them out here. 100ml cost S$30 and 250ml cost S$60 from its website. Disclaimer: Product was won for personal use only. All reviews are 100% honest and based on my personal experience. No monetary compensation of any kind was given or received for this review.